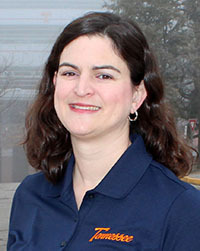 Stephanie TerMaath, assistant professor in the Mechanical, Aerospace, and Biomedical Engineering Department at the University of Tennessee, Knoxville, and affiliated faculty member of the Joint Institute for Computational Sciences (JICS), credits JICS as one of the reasons she came to UT. She says high-performance computing (HPC) and multidisciplinary collaboration are essential components of her research program, and adds that JICS is renowned for excellence in both areas, making it a perfect fit. TerMaath earned her degrees in civil engineering with a concentration in structural mechanics from the Pennsylvania State University (Bachelor of Science), Purdue University (Master of Science), and Cornell University (Doctor of Philosophy). She managed the Physics Based Computing Group at Applied Research Associates before her current appointment at UT. TerMaath’s research interests focus on applying computational engineering to solve complex, multi-physics problems such as preventing brain shunt failure and optimizing the design of multi-material parts through an integrated computational materials engineering (ICME) approach. From your perspective, what is the value-add of JICS to research? TerMaath: JICS provides access to cutting-edge supercomputing facilities and houses leading experts from many disciplines, making it an excellent resource for multidisciplinary research. Through JICS, we can easily build teams composed of experts from many diverse areas. This is essential in addressing today's multifaceted, disparate challenges, from developing renewable, clean energy sources, to colonizing Mars. Solving such complex problems requires a dramatic departure from traditional engineering practices. Formerly, engineers learned a particular field and spent their careers focused on it. But today many areas of expertise must work together to tackle emerging problems. We need teams made up of experts from many disparate disciplines to integrate their experience and look at problems from new perspectives. JICS provides the infrastructure to build such teams and then perform the work using its world-class computational facilities. The disease hydrocephalus is one of your main research interests. What is the nature of this problem, and what are the challenges involved in solving it? TerMaath: Hydrocephalus refers to a group of conditions in which cerebrospinal fluid (CSF), normally produced by the choroid plexus in the ventricles of the brain and re-absorbed at a relatively constant rate, accumulates in the ventricular system. This abnormal accumulation of CSF can be due to either obstruction of normal CSF flow pathways within the ventricular system, or deranged absorption of CSF by the arachnoid villi located on the surface of the brain. The result is an elevation of intracranial pressure causing neurological dysfunction and, in many cases, death. Symptoms of hydrocephalus include headaches, nausea, papilledema [swelling of the optic disc], seizures, learning disabilities, motor skills impairment, and head disfigurement. These symptoms typically worsen over time and may be fatal if untreated. Congenital hydrocephalus is present in one out of every 500 live births, and acquired hydrocephalus can occur at any age. In addition to patient suffering, the economic burden of hydrocephalus treatment in the United States alone approaches two billion dollars annually. While there is no cure for hydrocephalus, the most common treatment is the diversion of CSF from the ventricles to a part of the body in which it can be readily absorbed, such as the peritoneum [the membrane that forms the lining of the abdominal cavity]. This rerouting of CSF is usually accomplished by implanting a synthetic device—known as a shunt—that acts as a conduit for CSF. However, even with all of our technological advancement in the biomedical field, shunt failure is still a predominant problem in the treatment of hydrocephalus. Currently, well more than 50 percent of shunts require revision over the course of their lifetime. Some need multiple revisions. Statistically, hydrocephalus patients require two to four brain surgeries for shunt insertion or revision in a 10-year period after their initial diagnosis. One of the primary causes of failure and reoperation is obstruction of the shunt tubing, which typically necessitates a surgical procedure to replace the obstructed portion. Obstruction of the catheter in the ventricle is responsible for about one-third of all shunt revision operations. This blockage may result from the accumulation of blood or debris on the inner surface of the catheter or the entry of fronds [portions of the brain's white matter] or choroid plexus [epithelial tissue] into perforations in the proximal end of the catheter, preventing fluid entry. There is no universal agreement on what shape and size of catheter perforation are ideal to allow optimal fluid flow and minimize the aggregation of material within the catheter while mitigating entry of choroid plexus into the perforations. Given the life-or-death impact of shunt malfunction on patient health and the high percentage of shunt revision surgeries, an improved design of the ventricular catheter is imperative. The initial objective of TerMaath's medical device optimization research is to integrate supercomputing simulation and experimental testing to improve the design of ventricular catheters such that uniform flow through all holes is achieved. 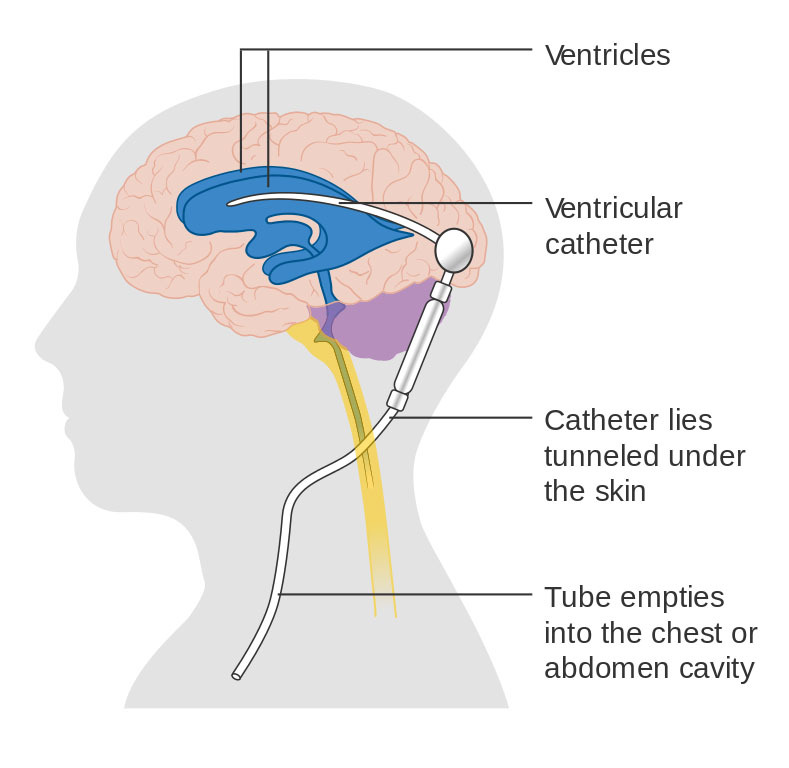 These catheters are a critical component in a shunt system, but obstruction of the tubes is largely responsible for shunt failures and revision surgeries. 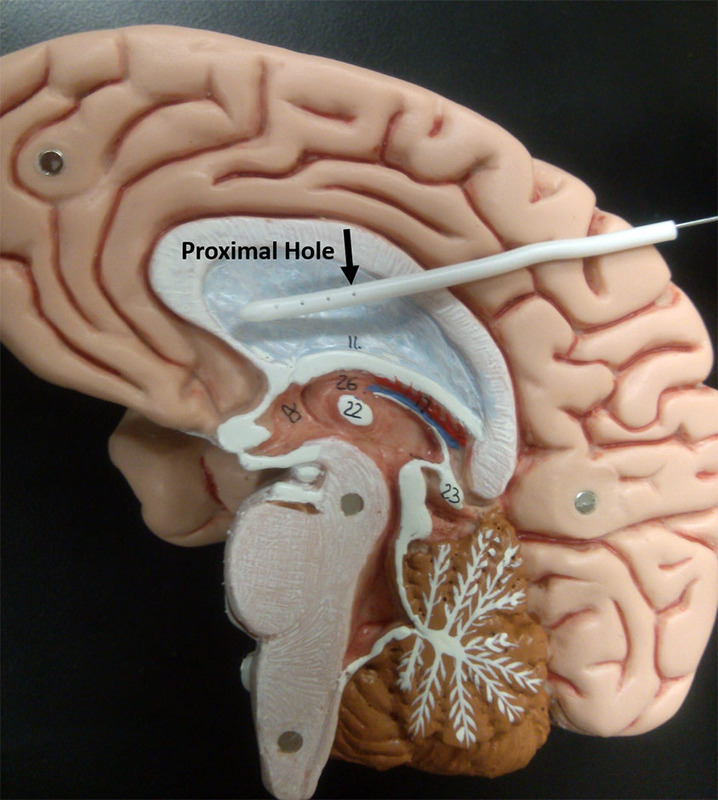 In the current design of the catheter, cerebrospinal fluid flow is primarily through one group of holes, the first ring of proximal holes around the circumference. With this design, if any solid matter flows into the tube causing a blockage, all holes are then ineffective. With all of the holes accommodating CSF flow, the probability of complete obstruction is reduced. TerMaath's hypothesis is that catheter redesign that is optimized for uniform flow across holes will reduce the obstruction rate. Our research is focused on developing and validating the models and methodology needed to investigate CSF flow through an obstructed catheter and then optimizing the design to prevent the blockages. This big-data problem necessitates the prediction of not only the CSF flow through an obstructed catheter but also the subsequent design optimization to assess the effects on catheter performance of hundreds of parameters that exhibit both aleatoric [random] and epistemic [scientifically limited] uncertainty, as well as data sparsity. For example, these parameters encompass geometric and material properties, CSF flow characterization; internal and external obstructions of random size, shape, and constituents; and time-varying intracranial pressure unique to each individual. Merely varying the basic geometric parameters while holding all other variables constant, results in more than 30 trillion design possibilities. Therefore, a comprehensive, probabilistic investigation must employ advanced sampling and optimization techniques to fully explore not only the sensitivity of shunt performance to all of these parameters but also the interactions between parameters. To do this study, computational fluid dynamics (CFD) is performed on the JICS supercomputing system called Darter by coupling the open-source code OpenFoam® with the optimization analysis toolkit, Dakota. In the spirit of the JICS collaborative environment, this project merges scientific knowledge from many diverse fields. Improved design and optimization of the ventricular catheter call for the integration of science from the multidisciplinary fields of HPC, neurosurgery, fluid dynamics, structural mechanics, materials science, nuclear imaging, mathematics, and probabilistic analysis, and we have team members representing all of these fields. The primary collaborators for the HPC component of this work are Ms. Sofy Weisenberg, a UT graduate student in Biomedical Engineering, along with two ORNL scientists, Dr. Charlotte Barbier [Instrument and Source Division, Spallation Neutron Source] and Dr. Judith Hill [Scientific Computing Group, ORNL Leadership Computing Facility]. This work would not be possible without the substantial contributions of Drs. Barbier and Hill. Is there a materials research aspect to the work you’re doing? TerMaath: There is, but exploring emerging technology is the next phase of this research. Many options for improving catheter performance are available through innovative combinations of sensors and advanced materials. For example, anti-bacterial and 'non-stick' coatings can be applied to the catheters, and researchers have looked at applying pulses to remove blockages. We would like to develop a holistic system using additive manufacturing to print an optimized design for each individual patient. The system would consist of anti-bacterial protection, a non-stick material, and embedded sensors for in situ health monitoring to track intracranial pressure and to ensure proper functioning of the shunt. This information could be transmitted to a wireless device similar to a Fitbit® that is worn by the patient to provide a real-time pressure monitoring and alarms to notify the patient of problems. This system may also be designed to be self-healing. For example, if the sensors showed that the valve was becoming blocked, settings could be changed or other steps taken to make the shunt last longer. Every extra few years the shunt works results in one less brain surgery for the patient. While the surgery is fairly straightforward, all the risks of brain surgery and the reduced quality of life during recovery still exist. An advanced shunt system is possible with today's knowledge and technology and could eliminate the multiple brain surgeries currently experienced by hydrocephalus patients. What have you accomplished on the hydrocephalus project to date, and what will be your ultimate measure of success? TerMaath: With the help of Dr. Barbier, we have a working 3D model for the computational fluid dynamics analysis. The results from analysis and experimentation clearly show that most of the CSF flow is through the proximal holes. We are in the middle of a full geometric optimization to redesign the shunt for uniform flow across all holes and to understand which parameters are the most influential. Concurrently, we are working with Dr. Arthur Ruggles' research group [UT Nuclear Engineering] to perform PET [positron emission tomography] imaging to better understand flow through obstructed shunts. This imaging will show the 3D flow pattern through the catheter and provide currently unavailable data for computational model validation. To our knowledge, this imaging will be the first 3D detailed experimental results that will be publicly available. We hope that by sharing this information other researchers will apply it to their work, and we can all collaborate to solve this complex problem. As previously mentioned, approximately one-third of shunt revision surgeries are due to catheter obstruction. Our ultimate measure of success will be a substantial reduction of revision brain surgeries due to an improved catheter design. At this point, have you had any publications associated with the hydrocephalus research? TerMaath: Our team recently wrote a paper on the history of catheters and their deficiencies, the first review article specifically on ventricular catheters. It was accepted to the Journal of Neurosurgery, one of the top publications in this field. We systematically discuss the historical design of the ventricular catheter, how it got to where it is today, and the problems with each design. We have four more papers planned for completion in the next six months. These papers provide the details of our statistical analyses on surgery effectiveness, CFD optimization, imaging results, and shunt obstruction research. Our goal is to disseminate our findings to all researchers working to improve shunt functioning. How does JICS benefit you as an educator and mentor, and, relatedly, what do you think students derive from their involvement with JICS? TerMaath: Because of JICS, I was a mentor at the 2015 International Summer School on HPC Challenges in Computational Sciences, which was co-sponsored by the National Science Foundation’s eXtreme Science and Engineering Discovery Environment [XSEDE]. As part of this program, I presented our HPC work on optimizing the design of ventricular catheters. I thoroughly enjoyed the ensuing discussion and the exciting ideas generated by the other attendees. I especially enjoyed my role as a mentor and discussing career paths with the students. As an international event, it offered opportunities to learn about other cultures and approaches to research. For example, one of my mentees was from Romania, a country I previously knew little about. On a daily basis, JICS gives students hands-on experience with cutting-edge computing resources. I am thankful to JICS for providing office space for my students and me. The students range from freshmen to post-doc levels in civil, mechanical, aerospace, and biomedical engineering, and in materials and computer science. For all of them, interacting with JICS' engineers and scientists is a tremendous benefit. About JICS: The Joint Institute for Computational Sciences was established by the University of Tennessee and Oak Ridge National Laboratory (ORNL) to advance scientific discovery and leading-edge engineering, and to further knowledge of computational modeling and simulation. JICS realizes its vision by taking full advantage of petascale-and-beyond computers housed at ORNL and by educating a new generation of scientists and engineers to be well-versed in the application of computational modeling and simulation for solving the most challenging scientific and engineering problems. JICS operates the National Institute for Computational Sciences (NICS) at the University of Tennessee that enables transformational research through advanced computing resources, facilities, and support, and provides education and training in high-performance computing. The center's mission is to expand the boundaries of human understanding while helping to ensure the continued leadership of the U.S. in science, technology, engineering, and mathematics. Established in 2007, NICS had the distinction of deploying Kraken, the first academic computer to break the petaflop barrier, Kraken in its prime was the National Science Foundation's flagship computing system for research. NICS is a leading academic supercomputing center and a major partner in NSF's eXtreme Science and Engineering Discovery Environment (XSEDE).